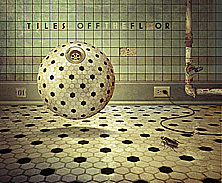 mwe3: What led you and the band to release a best of / live document for Tiles and what were the key events in the making of the Off the Floor CD? CHRIS HERIN: It was really a combination of things. First, back in 2010 it was apparent we wouldn't have a new studio album finished for a few more years. So maybe the time was right to do a proper live album to fill the growing gap since Fly Paper was released in 2008. Second, our 20th anniversary was looming and maybe we should do something to commemorate this milestone. Nowadays live albums don't generally sell well and are usually spun off from a live video. However, we felt producing a live DVD would be a huge distraction from our next studio album, so..., we coupled the idea to do some live recordings along with the concept of a 20th anniversary retrospective and figured an old-fashioned live CD still had merit under the circumstances. We could record our favorites that have been in our live set over the years, add a few new bits and offer something a little different than the studio versions - since we tend to improvise and stretch out some of the songs. Although we released a "live bootleg" from our European tour with Dream Theater, these were 2-track soundboard recordings and couldn't be remixed. They certainly sound good, but we wanted to record ourselves in a multi-track format and have the songs remixed. We decided to record "live in the studio" with a small audience because setting up recording gear in a club seemed like the hard way to go - especially if we weren't also recording the visual aspect. In the studio, we only needed to gather a few friends to play for and feel confident we could focus on our performance without worrying about things going wrong with the actual recording process. In fact, everything went so well we dug out more tunes and did two (and a half) sessions - meaning we've got Off the Floor 2 scheduled for release April 1, 2014. We also took advantage of the opportunity and wrote a new arrangement for "The Wading Pool" complete with flute, bass and keyboards. It was nice bringing in a couple special guests: Keith Kaminski of the Motor City Horns on flute (who tours with Bob Seger) and our go-to guy Matthew Parmenter of the band Discipline on violin and keyboards. Overall, our goal was to make Off the Floor more than just a run through of the songs. 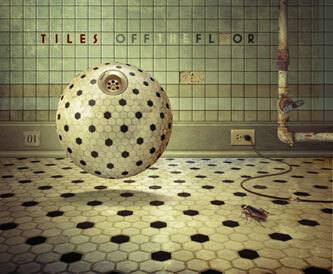 For Off the Floor 2, in addition to the main track list of ten songs, we selected four songs (nearly 40-minutes) from our appearance at the 2005 Rites of Spring Festival to include as an additional disc. We chose songs that aren't on either Off the Floor - "Facing Failure," "Ballad of the Sacred Cows," "Paintings" and "Window Dressing." We're really excited a live version of "Window Dressing" got recorded since we only played it live twice! It's also cool to have Pat DeLeon, our drummer from 1997 through 2005 - and on Window Dressing - represented. The second CD will also have the two promotional videos we did for each Off the Floor disc. 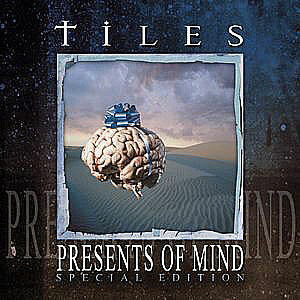 mwe3: mwe3.com was writing about Tiles way back in 2004 when the band was signed to Inside Out Music when you released Window Dressing. What was it like working with Inside Out back then and in what ways have the band evolved or changed over the past ten and now twenty years? CHRIS HERIN: Inside Out Music has done exceptionally well over the years. I think the key to their success is they've always been music fans first and that's helped them deliver such a great catalog of music. Also, look at their dedication to great packaging. The quality of what they release is always excellent. 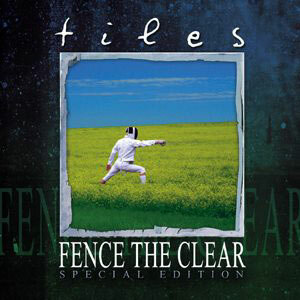 We signed with them in 1996 and our second CD Fence the Clear was the 14th album they released. 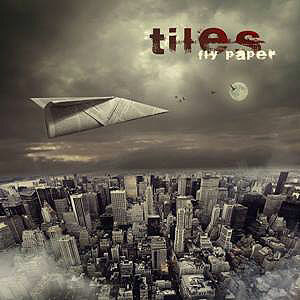 All of our releases are available on Inside Out including our 5th CD Fly Paper (2008). With any luck, they'll pick up the option on our forthcoming studio album Other Arrangements. Both Off the Floor discs are released through our own label (Standing Pavement) since it made economic sense to release them ourselves. I suppose every band claims they evolve in some manner and I guess we have too. I'm not sure how much is simply because of our changing interests, us changing as people, or as artists striving for something new and better. A band in our position might as well do as we please since financial success is not a factor hanging over our heads. I mean, we're not under pressure to keep the gold records coming! I'd like to think we've gotten better over time and learned to capitalize on our strengths and mitigate our weaknesses. The most important thing might be learning how to get out of our own way and not stifle the creative process. That's why we continue to use a producer - and are fortunate to work with someone of Terry Brown's caliber. We're firm believers in the old adage "you can't see the picture when you're in the frame." I know most bands have "visions" and don't like a lot of outside intervention. They want a producer to work in the margins, which to some degree I certainly understand. However, I've found that an objective 3rd party can take the music to a better place. But, this means the band has to "let go" of some control and put trust in someone else - which is what collaboration is all about. Musically, our evolution is sometimes devolution. For example, we came off Presents of Mind's dense arrangements, then took a stripped down approach on Window Dressing. From a song writing perspective, we tend to channel elements of the music that is capturing our interest at the time, or try new song writing approaches. For example, "Hide in My Shadow" off Fly Paper was mostly written on mandolin. I write the basis of many songs on my small Tacoma travel guitar. 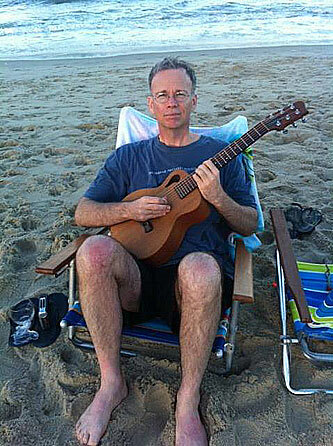 Jeff writes many of his parts on acoustic guitar. We also come up with songs based around Mark's drum patterns (which, aside from lyrics, is how a drummer gets writing credit!). However, clearly everything is grounded in a progressive rock aesthetic; which to us means anything goes within a "rock" format. We certainly don't claim to be breaking new ground - and we don't labor over how to change our music. It tends to morph as we change as people, develop new interests and become better musicians and songwriters. mwe3: Whats the musical chemistry between you and the other members of the Tiles group? Seems like you and drummer Mark Evans were the founders? 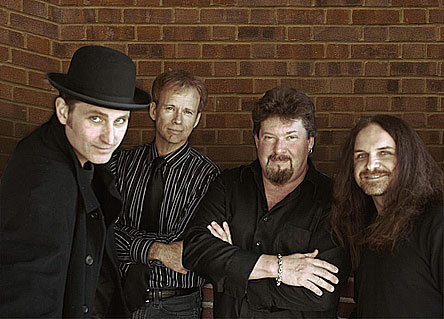 Would you say the band is more influenced by hard rock or prog-rock? CHRIS HERIN: Our chemistry is really quite good. We share lots of common ground yet possess yin & yang type personalities, which keeps things interesting. We share many of the same musical influences and perspectives and have quite a diverse set of interests. Progressive and hard rock of course, jazz, classical, metal, pop, etc... I suppose the influences we bring into Tiles are probably 50% prog, 30% rock and 20% everything else. Mark and I have a long history dating back to the mid-1980's when we met at Central Michigan University. We stuck together and kept forming bands until one of them finally lasted! mwe3: Theres a great instrumental track on the Off The Floor collection called A Minor Interlude. How does instrumental rock fit into the Tiles recording sound? 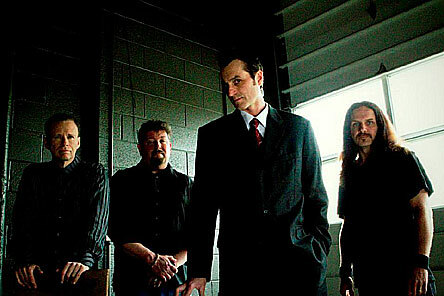 CHRIS HERIN: Bassist Jeff Whittle wrote "A Minor Interlude" so that live I could change guitars, get the mandolin ready, and prep the keyboards for "Checkerboards." Jeff is a prolific writer of, I guess you could say, musical vignettes. Some get swallowed up into the song writing process and others stay as standalone compositions. Many of our favorite bands have done instrumentals - or are instrumental bands (like the Dregs, etc.) and certainly the progressive rock heritage demands instrumental passages within vocal tunes. They're fun to compose and fun to play. We like to use the short passages in a similar way as Jethro Tull. Little breaks in the action. mwe3: What is the song writing process like in Tiles and how do songs evolve from sonic idea to finished project? CHRIS HERIN: Oops, I guess I answered part of this question a little earlier, but I should add that even though I'm the "songwriter" for the band, everything gets processed through the entire band. Meaning, as we learn what I present things can, and do, get changed. I use many of the riffs and bits of music Jeff writes and sometimes we swap parts in and out of songs as they develop. Also, sections of music can change depending on what Mark plays. I've learned not to be overly possessive and let various "influencers" work to make the song better, hopefully. There are times though when I invoke "songwriter privilege" and put my foot down on something! mwe3: What guitars are you playing on the Off The Floor CD and what are your favorite guitars, amps and other devices do you use to enhance your guitar tones? What is your guitar / band practice time like? 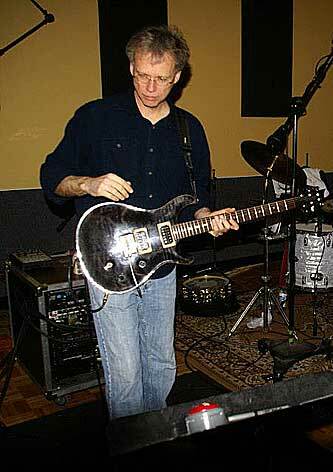 CHRIS HERIN: I used my 1990 Paul Reed Smith for everything on "Off the Floor 1 & 2." I use a Les Paul, ES-335, Stratocaster, Telecaster and the PRS in the studio; but live the PRS covers a wide range of tones. I've used a Mesa Tri-axis ever since our tour with Dream Theater. Playing through John Petrucci's rig was an "ear-opening" experience and made me an instant convert to Mesa amps and cabinets. I also modeled my set up off Steve Morse's stereo set-up where he's got a dry signal in the center with the left and right stereo effects on each side (of the dry signal). Live, I use a Lexicon multi-effects unit but in the studio, I usually leave the effects up to Terry during mixing. Although, I'll sometimes color the tone with some of my old MXR pedals. The other major part of my sound is Elixir Strings. New, they have a great presence and brightness; they last a long time and age gracefully. I kept a set on my Tacoma Papoose for nearly three years! They had such a unique tone I hated to change them, but the peg heads were starting to rust! I've been using the Mesa TA-15 head a lot lately too on the new album. Great tones and versatility - and it's easy on my aging back! What we do during band rehearsals depends on whether we're working on new songs or preparing a live set - and sometimes a combination of both. We also spend time jamming and even working up an occasional cover song for fun. Personally, I seem to spend most of my time writing and these days I tend to practice technique when I have an immediate problem to fix! I still work on classical guitar tunes which helps keep my fingers and mind in shape. 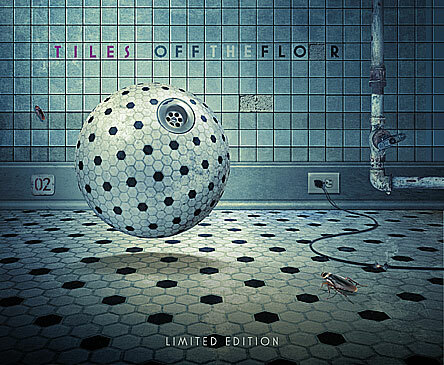 mwe3: What tracks on Off the Floor stand out in your mind as representing the best in the Tiles sound? How about the prog-metal track Dragons, Dreams & Daring Deeds? What album is that track from and how was cutting live in the studio compared to the original album version? 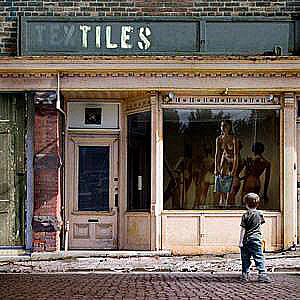 CHRIS HERIN: Well, the "best" of Tiles is really something for people outside the band to decide. It's not as if we have a history of hits to help us choose - like Elton John! Sometimes our favorite songs are never played live due to instrumentation - like my personal favorite "Reasonable Doubt" off Presents of Mind. Certainly, we have our favorites and I think we gravitate toward playing those songs live. Dragons, Dreams & Daring Deeds is from the Fly Paper album and is one of my favorites. I recall it came together relatively easy in the studio and we didn't have much trouble working it into our live set - although there are some tricky bits and seat-of-the-pants moments. We always record live in the studio, as a band, even though we're only after the final drum tracks - which means we can always play the basics of a song as a complete composition. Some songs (like "Dragons" or "Checkerboards") we seem to have an affinity for and can usually spot the difficult ones early on ("Markers" comes to mind). mwe3: Where and when was Off the Floor recorded and what was the recording process like? Were computers used a lot in the making of the album? Who else worked with you to get the sound in the recording, mixing and mastering process? CHRIS HERIN: Off The Floor (1 and 2) were recorded over three separate sessions: January 8, 2010; February 6, 2010; and a shorter session April 24, 2010. We recorded locally (Detroit) in what you could call a "soundstage" setting at Sound Escape Studio with Robert Phillips engineering and helping co-produce. We set up as we would for live performance - vocals coming through a PA and each of us had monitors too - so there were instruments bleeding into all the microphones. This gave poor Terry Brown fits during mixing as he had to compensate for different instruments being in microphones where they shouldn't be. As I mentioned earlier we corralled a few friends and fans to watch and listen to the proceedings so we could have someone to play for. We'd play each song a couple times and pick the best version. We nailed a few tunes on the first take and didn't bother with a second take. Oddly enough, a couple of our "staples" which we usually don't have problems with caused all sorts of trouble; "Patterns" being the worst offender. I even remember sifting through all the board tapes from the tour with Dream Theater looking for a good version of "Patterns" - 9 times out of ten that song rolls out of us without a problem, until we need it to. Anyway, we recorded the songs (digitally using Nuendo software) then set them aside while we concentrated on some new tunes. We didn't revisit them until 2011 when Terry Brown started mixing. Then both my parents passed away within months of each other and I had to step away from the band and tend to a lot of family business. Although we did occasionally work on new material, it wasn't until early 2012 when we asked Terry to finish mixing, had Peter Moore (Terry's favorite mastering engineer) master, roped Hugh Syme into doing the cover, got the packaging and release details together and finally released Off the Floor on September 3, 2012.
mwe3: Tell us about that great artwork for the Off the Floor CD album artwork? 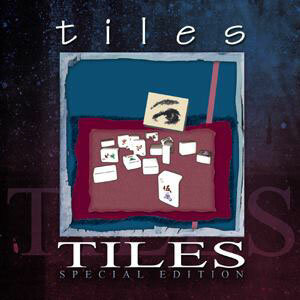 Tiles always had amazing cover art for their albums. CHRIS HERIN: Thanks, but all credit goes to Hugh Syme. His body of work speaks for itself. We feel strongly that artwork enhances the presentation of the music and brings a visual element that helps inspire the listener's imagination. Or..., simply put, looks cool and interesting! This is why we budget a little extra for Hugh Syme. He always adds little nuances and secondary meanings. It's been a great privilege to work with Hugh, Terry and Peter on all our projects since 1999.
mwe3: What are you looking forward to in 2014 as far as writing, recording and live shows and tell us about the next Tiles release coming up soon. CHRIS HERIN: Well, there's the two-disc limited edition of Off the Floor 2 scheduled for release April 1, 2014. Now that Other Arrangements is about 60% finished, we've talked about getting a live set rehearsed and playing out in support of the Off The Floor albums. We'll keeping recording throughout 2014 and hope to have the new album wrapped up in the fall. We're doing vocals and guitar overdubs right now and have a few special guests to get organized. We've finally succumbed to temptation and created a traditional concept album. Other Arrangements is a story. It has a start, a journey and kind of an ending. Musically, there are recurring themes, reprises and an almost symphonic structure with the pacing of the songs' peaks and valleys. We are even embracing a little electronica! So, after a few years out of circulation the next few years will see more activity out of the Tiles camp. I've also been recording some of my song writing backlog and hope to release a series of EPs starting in 2014. The songs feature Matthew Parmenter (Discipline) on vocals, Kevin Chown (Tarja Turunen, Chad Smith's Bombastic Meatbats, Edwin Dare) on bass, Terry Brown on drum programming and Hugh Syme on keyboards. Thanks for the interview opportunity and keep up the good work with mwe3.com!